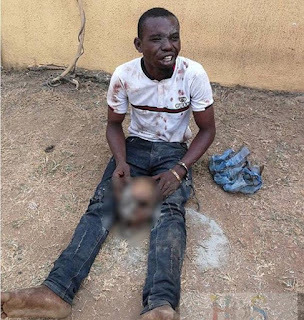 Men of the Ogun State Police command has arrested a 25-yr-old man identified as Babalola Alex, for being in possession of a human skull. The suspect, an indigene of ondo state, was on thursday 1st February, arrested at Asese area of Ogun state by the men of the anti-robbery squad. Oyeyemi said the informant was in a nearby bush to ease himself when he sighted two men with an item suspected to be human skull being put in a sack. The police then went after the suspects arrested one of them while the other escaped and upon search, the item was discovered to be human skull.